And a FOURTH Foreign Imam Promotes Hatred—Cancel His Visa! 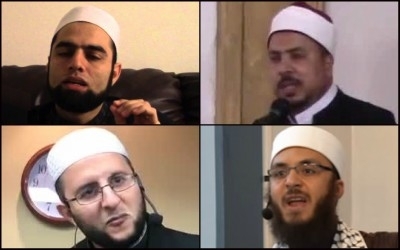 Clockwise from top left: U.S.-based imams Abdullah Khadra, Aymen Elkasaby, Raed Saleh Al-Rousan, and Ammar Shahin share common tastes in headwear and an abiding hatred of Jews. The Middle East Media Research Institute (MEMRI) has yet again discovered an extremist imam who delivered an anti-Semitic sermon in Arabic, this time in Raleigh, NC. The imam, Syrian-born Abdullah Khadra, spoke on December 8, 2017—the same day as the violent sermon delivered by Aymen Elkasaby in New Jersey, and that of Raed Saleh Al-Rousan in Houston, which followed the Trump administration's acknowledgment of Jerusalem as Israel's capital. Just as the others did, Khadra called upon Muslims to "contribute to regaining" control over Israel, saying, "The Prophet Muhammad gave us the glad tidings that at the End of Time, we will fight those Jews until the rocks and the trees will speak: Oh Muslim, this is a Jew behind me." Here, Khadra was referencing the infamous Hadith which continues, "...there is a Jew behind me, come and kill him." Along with the Davis, CA imam Ammar Shahin, who in July 2017 called on Muslims to kill Jews around the world, this brings the number of extremist imams revealed by MEMRI since 2017 to four. Astoundingly, all four of these imams came to the United States using a student visa or a religious-worker (R-1) visa. Khadra first came to America on an R-1 visa in 2011. (In April 2017, he was reported to be applying for political asylum.) Elkasaby's employer applied for an R-1 visa for him in 2016. Shahin came to the United States in 1999 on a student visa — initially to study computer science, but then remaining as a perennial student of Arabic, Islamic Studies, and Islamic Sciences. (He is currently a PhD student at the Islamic University of Minnesota, which is known for pervasive links to extremism.) Similarly, Al-Rousan came to the U.S. in 2007 from Jordan to pursue a master's degree at the Graduate Theological Foundation in Indiana, almost certainly using a student visa. Visa holders who incite violence in this fashion should jeopardize their legal status in this country. As the saying goes, once is happenstance, twice is coincidence... but four times? America has no need to import hatred from abroad, to infect its own communities. An easy first step is to simply enforce existing law. The Trump administration's "extreme vetting" program imposes no new requirements on visa applicants, merely providing the resources and bureaucratic mandate for screeners to apply the requirements that already are in place. Beyond that, visa holders who incite violence in this fashion should jeopardize their legal status in this country. Abuse our hospitality, and we have no reason to continue extending it. All we need is the political will to enforce our own laws, and to protect the U.S. Muslim community from the virus of foreign hatreds.